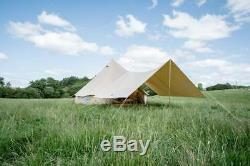 Carefully chosen 100% cotton canvas bell tents & camping accessories at affordable prices. Fully guaranteed for 12 months. 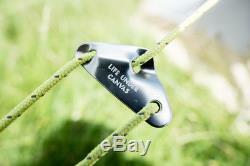 Highest Quality Canvas, ropes and fittings. 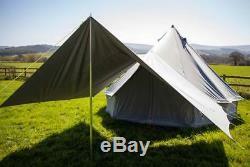 400 x 260cm Large AWNING with extra eyelets For all Bell Tents Sand or Grey. 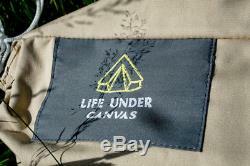 280g 100% cotton sand canvas - rot, mould and water resistant. Strong polyester guys - more secure in high winds. Grooved pegs - to prevent slipping guys. Metal sliders - stronger than plastic, more secure in high winds. 1 x Metal pole - spring loaded for strength and durability. Eyelet attachments - connect securely to tent door pole and pole supplied. Unique to Life Under Canvas Awnings. Plus = Extra eyelet attachments - Eyelets on each corner of awning to use with additional poles. Double extendable pole set - available as extra to allow the side of the awning to be flipped open. Single extendable pole - available as extra to increase entrance height of awning. 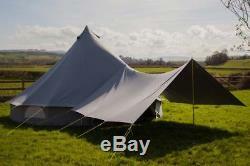 All Life Under Canvas bell tents come with the fixings needed to attach an awning to the front door pole. 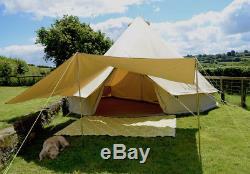 Why not add this option for some extra undercover space or use it alone for a garden canopy or camping shelter. Shelter from the sun, wind or rain; or just extra living and chilling space. 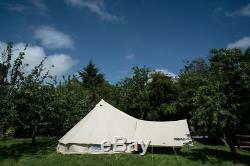 Manufactured exclusively for Life Under Canvas to a high specification. 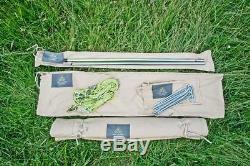 Use with one of our additional extendable poles to create a higher entrance to your awning and bell tent. 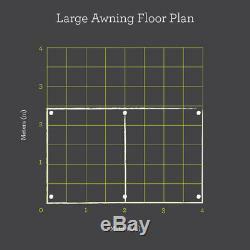 Use with the double extendable pole set to create an awning with open side. Use with both pole sets to create an independent space. This awning comes with one pole. Available in Sand or Grey canvas. The item "400 x 260cm Large AWNING with extra eyelets For all Bell Tents Sand or Grey" is in sale since Monday, April 9, 2018. 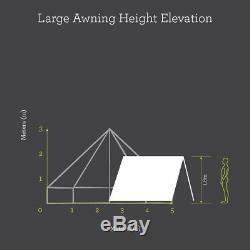 This item is in the category "Sporting Goods\Camping & Hiking\Tents & Canopies\Canopies & Shelters". 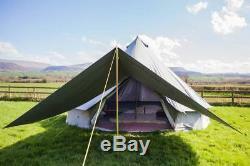 The seller is "lifeundercanvas" and is located in Herefordshire. This item can be shipped to United Kingdom.